With plush bucket seats, bustle backs and smooth leather match upholstery, this piece radiates luxury. You can recline effortlessly with just the push of a button, and a one piece chaise provides full support for your legs. Traditional nail head trim decorates the arms and sides of the piece. 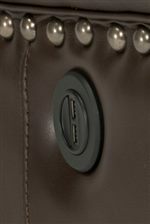 Optional USB ports are available for an additional charge. The Latitudes-Grover Leather Match Power Glider Recliner with Nail Head Trim by Flexsteel at Conlin's Furniture in the Montana, North Dakota, South Dakota, Minnesota, and Wyoming area. Product availability may vary. Contact us for the most current availability on this product. 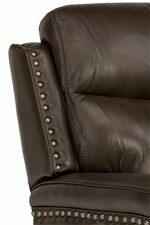 Arm Track arm decorated with nail head trim and wrapped with a sleek pillow for style and comfort. Seat Bucket seat contours to your bottom creating a comfortable seat in which you can relax for hours. The Latitudes-Grover collection is a great option if you are looking for Contemporary furniture in the Montana, North Dakota, South Dakota, Minnesota, and Wyoming area. Browse other items in the Latitudes-Grover collection from Conlin's Furniture in the Montana, North Dakota, South Dakota, Minnesota, and Wyoming area.